We have created a series of Raspberry Pi Tutorials, in which we have covered Interfacing of Raspberry Pi with all the basic components like LED, LCD, button, DC motor, Servo Motor, Stepper Motor, ADC, shift Register, etc. We have also published some simple Raspberry Pi projects for beginners, along with some good IoT projects. 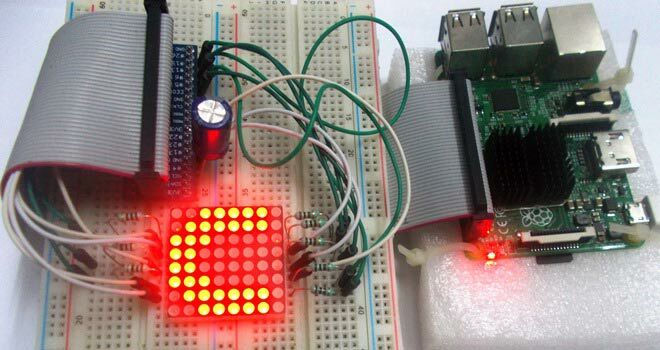 Today, in continuation of these tutorials, we are going to Control 8x8 LED Matrix Module by Raspberry Pi. We will write a python program to show characters on the matrix module. Also check Interfacing 8x8 LED Matrix with Arduino and LED Matrix with AVR Microcontorller. An 8*8 LED matrix module contains 64 LED (Light Emitting Diodes) which are arranged in the form of a matrix, hence the name is LED matrix. These compact modules are available in different sizes and many colors. One can choose them on convenience. The PIN configuration of the module is as shown in picture. Keep in mind that, the pinouts of module are not in order so the PINs should be numbered exactly as shown in picture for avoiding errors. So for 8 rows, we have 8 Common Positive Terminals (9, 14, 8, 12, 17, 2, 5). Consider the first row, the LEDs from D1 to D8 have a common positive terminal and the pin is brought out at PIN9 of LED Matrix module. When we want one or all LEDs in a ROW to be ON, The corresponding pin of LED MODULE should be powered with +3.3v. Similar to common positive terminals, we have 8 Common Negative Terminals as columns (13, 3, 4, 10, 6, 11, 15, 16). For grounding any LED in any column the respective common negative terminal to be grounded. The connections which are done between Raspberry Pi and LED matrix module are shown in below table. LED Matrix Module Pin no. Raspberry Pi GPIO Pin No. Here we will use Multiplexing Technique to show characters on the 8x8 LED Matrix Module. So let’s discuss about this multiplexing in detail. Say if we want to turn on LED D10 in the matrix, we need to power the PIN14 of module and ground the PIN3 of module. With this LED D10 will turn ON as shown in below figure. This should also be checked first for MATRIX to know everything is in order. Now, say if we want to turn on D1, we need to power PIN9 of matrix and ground the PIN13. With that LED D1 will glow. The current direction in this case is shown in below figure. To avoid this problem, we use a technique called Multiplexing. We have also discussed this Multiplexing Technique while interfacing 8x8 LED Matrix with AVR, here we are explaining again. This same multiplexing technique is also used in Scrolling Text on 8x8 LED matrix with Arduino and with AVR microcontroller. Let’s say for example, we want to only turn on LED D1 and LED D10 without turning on D2 and D9. Trick is, we will first provide power to only LED D1 using PIN 9 & 13 and wait for 1mSEC, and then we will turn it OFF. Then we will provide power to LED D10 using PIN 14 & 3 and wait for 1mSEC then will turn it OFF. The cycle goes continuously with high frequency and D1 & D10 will getting On and Off rapidly and both the LEDs will appear to be continuously ON to our eye. Means we are only providing power to the one row (LED) at a time, eliminating the chances of turning on other LEDs in other rows. We will use this technique to show all characters. At this speed, the display will be seen as continuously showing “A” character as shown in figure. The Python Program for showing Characters on LED Matrix using Raspberry Pi is given below. Program is well explained by comments. Port Values for each character are given in the program. You can show whatever characters you want by just changing the ‘pinp’ values in the ‘for loops’ in the given program. Also check the Demo Video below. IO.setup(12,IO.OUT) #initialize GPIO12 as an output. IO.setup(22,IO.OUT) #initialize GPIO22 as an output. I see the resistors in the diagram but i cannot see the capacitor. "8 Common Positive Terminals (9, 14, 8, 12, 17, 2, 5)"